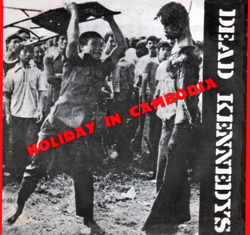 From Wikipedia: “Holiday in Cambodia” was the second single by the American punk band Dead Kennedys. The record was released in May 1980 on Alternative Tentacles with “Police Truck” as the b-side. The title track was re-recorded for the band’s first album, Fresh Fruit for Rotting Vegetables (1980), and the version that appeared on this single, as well as the single’s b-side, are available on the rarities album Give Me Convenience or Give Me Death (1987). The cover picture of the single is taken from the 6 October 1976 Massacre in Thailand, and depicts a member of the rightist crowd beating the corpse of a student protester with a metal chair. The song attacks both Eastern totalitarianism and Western complacency. The song’s lyrics offer a satirical view of young, self-righteous Americans (So you been to school/For a year or two/And you know you’ve seen it all/In daddy’s car/Thinkin’ you’ll go far…) and contrast such a lifestyle with a brutal depiction of the Pol Pot regime of Cambodia (Well you’ll work harder/With a gun in your back/For a bowl of rice a day/Slave for soldiers/Till you starve/Then your head is skewered on a stake). What you need, my son. Pol pot, pol pot, pol pot, pol pot, etc.